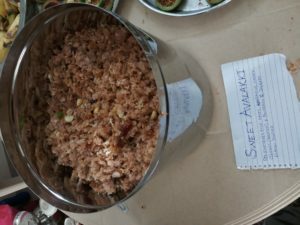 The fifth-year anniversary celebration of the Swarnaprashna Parenting Community, which happened in June with over 40-50 parents and their family and children, was a one of a kind meeting of like-minded parents who share a common vision for health and spirituality alike. 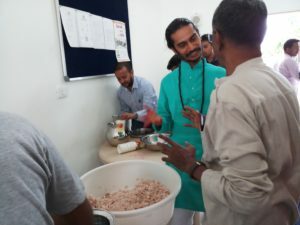 One of the super hit sessions at this celebration was the session of Dr. Maran G, who is a raw food activist and a firm proponent of Naturopathy. All of us were so bowled over by his enthusiasm and his super helpful attitude towards knowledge sharing, that it is but inevitable that we will all demand for a repeat (this time, more detailed!) session with Dr. Maran. 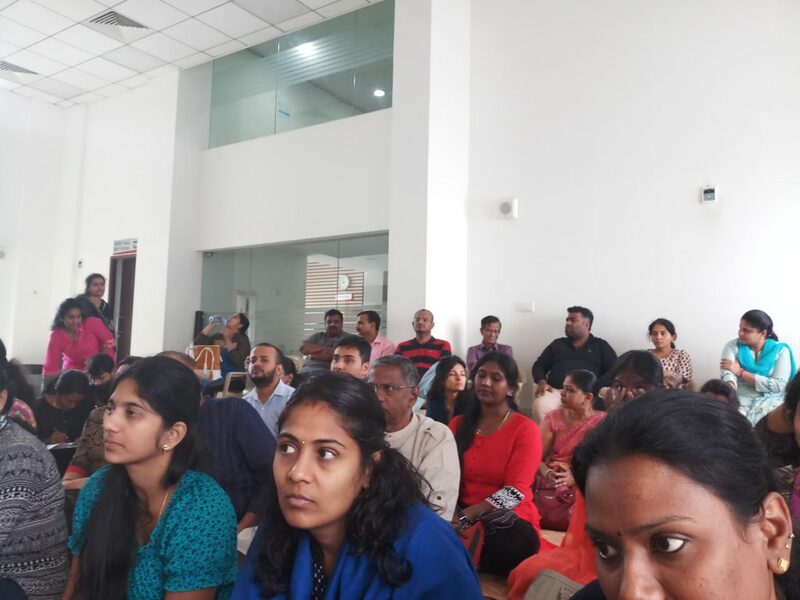 So, with the stars aligning, we were fortunate enough to enjoy two wonderful sessions with Dr. Maran in the last month – one in Chennai (organized by parent Priya) and one in Bangalore – which happened this past Saturday. I was part of the session at Bangalore and feel honored to share the knowledge gained at the session which Dr. Maran so gracefully shared with us all. But before we dive in straight to the learning, let me write a bit about Dr. Maran. 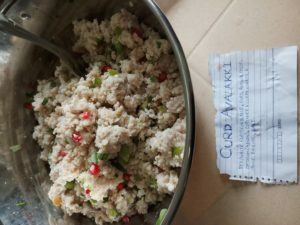 Maran G or Maranji as we liked to call him, is what you might call a food and health revolutionary. Hailing from Tamilnadu, Dr. Maran, who must be about 60 or so years old, has been tirelessly working the last 20 years (or perhaps even more) with a single motive to help families avoid expensive medical costs and realize that they can cure themselves of all diseases with a simple belief that Food is Medicine and Medicine is Food. A very humble soul and a great orator, Dr. Maran, who is a Naturopathy doctor, also runs a small all natural food restaurant at Sivakasi. One of the notable achievements of this restaurant is that they don’t use any of the five whites (Sugar, Salt, Maida, Milk and White Rice/Wheat) – and yet, over 250-300 people regularly visit this restaurant every single day in search of healthy and safe food. Dr. Maran regularly travels across South India to talk about healthy food habits and healthy lifestyle practices to lead a healthy and happy life. For all his wonderful knowledge and status, he might be one of the most humble men you might ever meet. The world certainly needs more of his kind. As you might have guessed, any time we spend with such a person is bound to be filled with so much learning and so much realization of the simple truths about life. So it was the session that happened in Bangalore. Dr. Maran spent about 5-6 hours addressing all of us non-stop with not a single pause or break – that itself can be the proof of how the right food and lifestyle habits can help someone face all the demands of a day without breaking a single sweat! Dr. Maran, nonetheless to say, is a man who practices what he preaches and is an inspiration to all of us – if we can be half of what he is at that age, I am sure that will be a great achievement given the rush and mindlessness that we live in. As I sit now and try to pen down what I learnt this weekend, my mind simply boggles at the task before me! Every single second of the session was so useful and so full of information, that it would be impossible for me to capture every single one of it here without being confusing or overwhelming. So I will try to share the essence of what I learnt (given that I have about 15 pages of hurriedly scribbled notes to decipher). I am going to write it down as we covered it during the session without putting my own wrapper or inference around it though I will try to bracket it into categories wherever possible so that it is easy for you to read and remember. If you are unclear about what a certain point might mean, do comment and I will see if I can recall and try to elaborate it out for you. 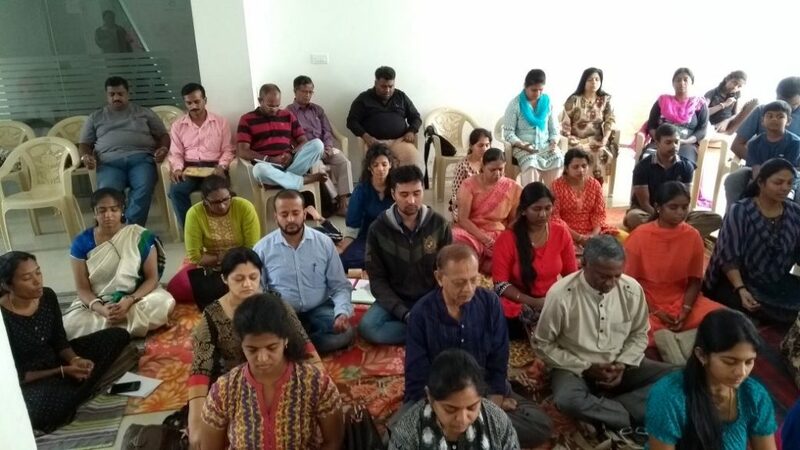 Before the day’s session began, as has become our usual practice, Velu did a guided meditation for all parents gathered around. Few peaceful moments where we were called into recognize our own consciousness and its power to go far and beyond our immediate comprehension. By the end of this meditation, all of were feeling so centered and calm – just the right mindset to receive the downpour of wisdom all of us got from Dr. Maran! 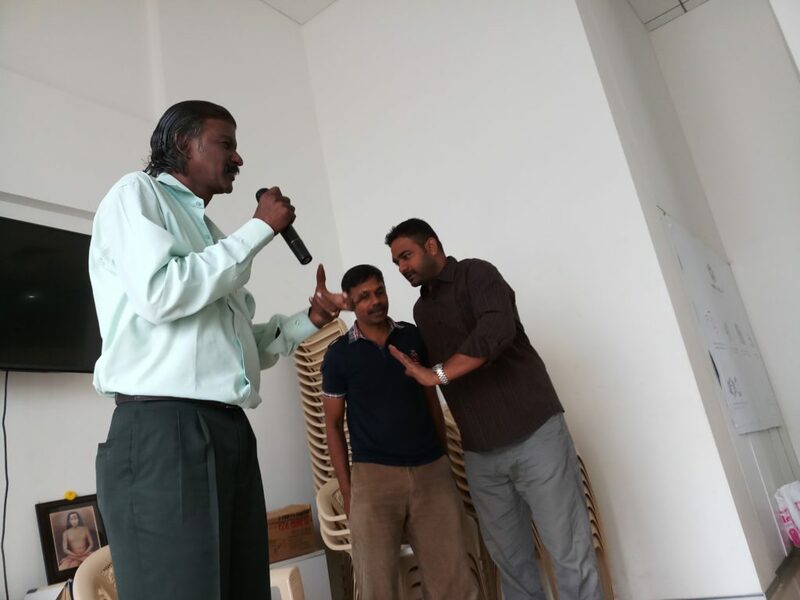 One of Dr. Maran associates, Mr. Mukesh Jain, who is a laughter and yoga therapist, joined us soon after to kick start the day with a quick laughter session that will set the trend for the day – a fun and jovial mood to break the seriousness and magnitude of the topic at hand. And then, it was time for Dr. Maran (many thanks to Parent and healer Anand who helped translate). The basic premise is that we are what we eat. One must understand that Food is Medicine and Medicine is Food. So, if we want a healthy body, all we need to do is look at our food habits. All causes of diseases and the many symptoms of the many diseases are just one – which is Morbid Toxin Accumulation in the body. So what are these toxins? It can be the polluted Air we breathe, the contaminated water we take OR it can be the bad food we consume – that is all. With that understanding, it will be easy to know that if all diseases are a result of one root cause, however different the disease or its symptoms are, all of them can be dealt with the same treatment – i.e. Complete Detoxification and a return to healthy food habits and lifestyle giving the body time and energy to heal itself. While Modern Medicine has been a great life saver (in the case of emergency surgeries, accidents and such), it has not been very kind to humans in its very quick recommendations for synthetic-chemical based medicines (more toxins to the already toxic loaded body! ), operations and unnecessary amputations and eviscerations. So before one turns to this option, one must firmly look at one’s own lifestyle and food habits and identify the root cause of the disease instead of asking for quick-fixes from the Doctors of modern medicine. One must understand and go back to our elementary school lessons that all of us have forgotten – Cooking takes away the essential nutrients in our food. Cooking is an unnecessary wastage of energy. Cooking is not required for a man to consume food. The early man might very well have been a fruitarian and if he could have in that harsh environment, we very well can be now. But given that we have got used to eating cooked food in the past few generations, how can we go back to this basic healthy way of living? Where do we start? Simple – Just switch 30% of your food intake to raw and clean – that should be more than enough to see you through. 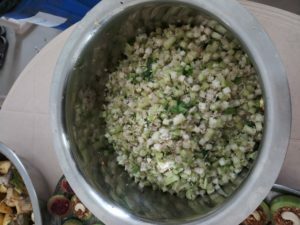 This roughly translates to a minimum of ONE COMPLETE raw meal (consisting of fruits, vegetables and plain juices/milk extracted from millets/grams/grains) per day. It doesn’t, however, stop at only food. We must also look at our overall lifestyle and make sure it is healthy. For instance, our good food habits must be complemented by good eating habits – i.e. 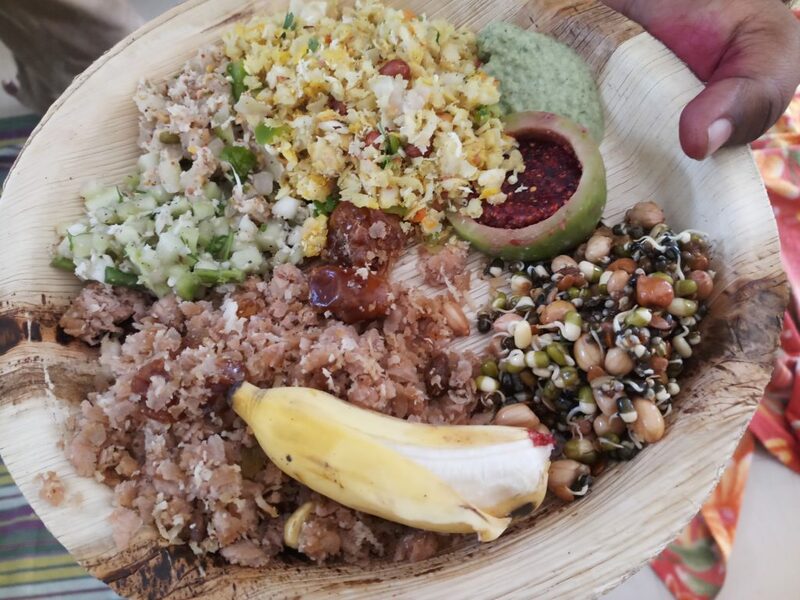 for instance, giving complete attention to what we eat, biting each morsel minimum twenty or times till all the saliva is mixed with it (which is what helps digestion – as digestion starts right from mouth and not just in stomach as we believe). Physical Exercise is also mandatory as is cultivating a good mind. Finally, you can reverse most if not all diseases if you are totally willing to commit to a raw and clean food habit. Dr. Maran has cured many a people with his simple diet plans and lifestyle modification recommendations. 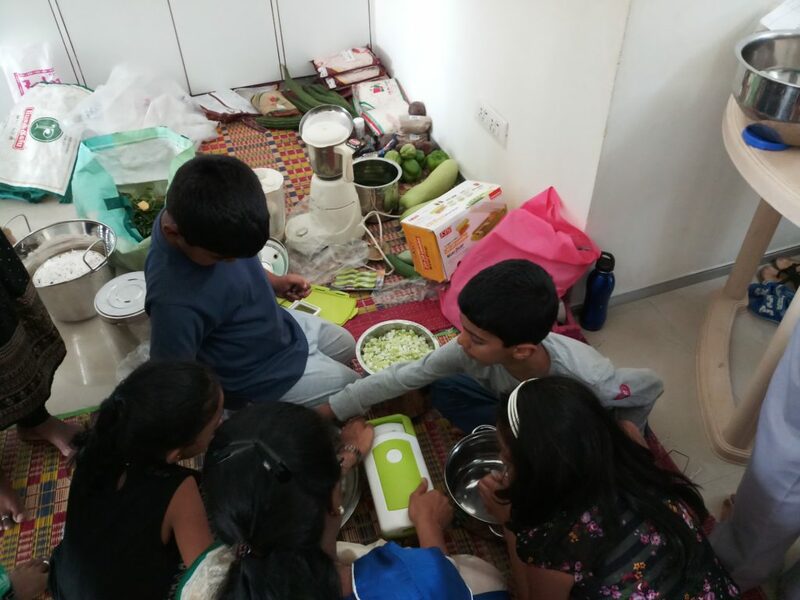 Our wholesome food getting ready – helped by kids! Replace the five whites mandatorily. 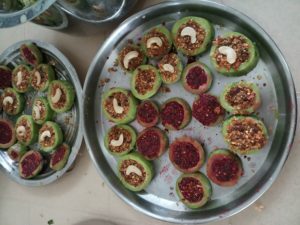 Sugar can be replaced by Jaggery or Plam Sugar. Salt can be replaced by Sea/Rock Salt or Himalayan Pink Salt. 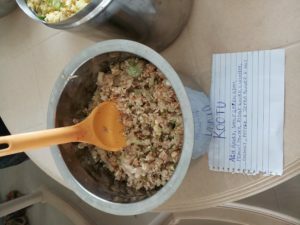 Maida and White Rice can be replaced with traditional millet or unpolished rice varieties. 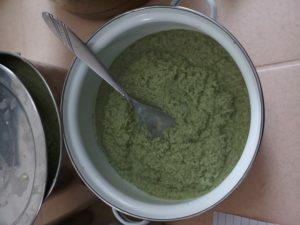 Milk can be replaced with Milk alternatives such as Coconut Milk or Sprout’s Milk. In addition to nutrients, Cooking takes away the natural taste of the food as well which is why we need to add extra spices to dishes. If we get used to eating raw for a minimum one week, our taste buds will stop asking for “spicy stuff”. So start by consuming at least one raw meal a day. Every meal must begin with fruits or raw vegetables (30-60 minutes before the meal itself). Consume plenty of water. Look at detox waters to help detoxify and restore body balance. Water must also be consumed like solid food. Sip by sip mixed well with saliva. Practice Bhastrika Pranayama to detox your lungs and handle pollution in the air we breathe in. Assimilation and Elimination must happen smoothly for the body to function well. Pay attention to both these processes. Chew completely to ensure food is mixed well with Saliva. 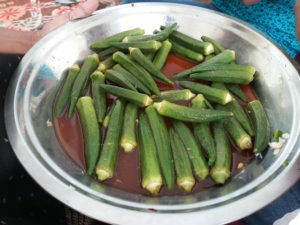 Saliva is the one that helps in digestion and it is also an insulin balancer if you will. Never control body urges including the urge to urinate and defecate. One must defecate at least twice a day. 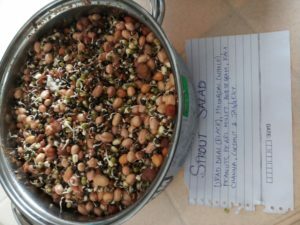 This will automatically get streamlined if one switches to natural/raw food at least once a day. Eat only when hungry and never go by the clock. Eat slowly and without distractions such as TV or mobile. Try not to talk as well while eating. Pay complete attention to what you are eating. Physical exercise and body activity is a must for healthy living. One must walk barefoot at least for half an hour a day outdoors. If not possible, at least walk in the shape of eight inside the house. Get up before sunrise. Do “Angapradikshina” and super brain yoga to keep your digestive system and nervous system active and healthy. Be childlike and cultivate a happy mindset. Dressing is also important for a healthy body – avoid tight and clingy dresses made out of unnatural fibers such as polyester and such. Help others and derive mental satisfaction. This, in turn, will help you reach a feeling of satiation and happiness. Never have a physical relationship with your partner within 3 hours of eating. All the blood will be re-directed to the physical act and food will turn to toxins. The best time, thus recommended by our elders probably keeping this in mind, is in the early morning well away from the last meal of the deal. Never eat after 7 pm. Practice Oil Bathing regularly without fail. If your lifestyle doesn’t allow it, at least do oil pulling. Have seasonal fruits. Consume desi (non-hybrid only) and organic fruits only as much as possible. For all other food, wash with salt and lemon to get rid of chemicals as much as possible before consuming. Don’t consume too much water just after a meal. Give at least 30-60 minutes gap. You may consume Detox water if you feel thirsty during this time. Finally, practice fasting as well to complement your healthy food habits. So, all of us might have the same questions in our mind the minute we hear we must switch to at least 30% raw food in a day- how can we survive without any spices and simply eat just fruits and raw vegetables every single day? Well, it need not be that way. 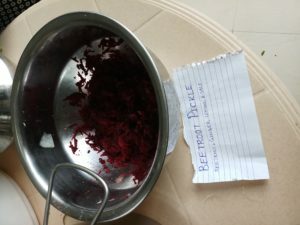 We can definitely create some wonderful recipes with spices such as dhania, jeera, and pepper and create some lip-smacking raw recipes. Do lookout for the English translated publications of Dr. Maran’s recipe books. 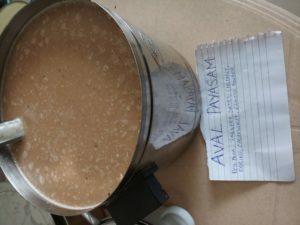 For now, here are a few recipes Dr. Maran shared during the meet (he shared some more as well – but I haven’t been able to blog them all). 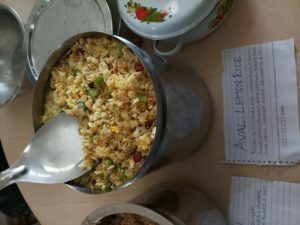 We also had the great fun of eating all of these items (and more) prepared by Maranji’s assistant/cook Mr. Ramesh (who was helped by many parents as well including Divya, Nandhini and others). What I have shared is probably just 50% of what Maranji shared or even lesser. I hope you get a chance to attend his session yourself and get to learn as we all did this time. Before I wrap up, I must also thank Mr. Mukesh Jain – who spent well over an hour making us all laugh – the only thing we didn’t do was ROFL (rolling on the floor laughing). We did everything else laughing – yoga, exercise, talking, moving, dancing, the formation of an energy circle….and what not. My god, Mr. Mukesh never let his smile or laugh dim even for a single second – such was his commitment to giving us all a memorable day of laughter. As they say, a day without laughter is a day wasted. Though it will by no means be a day wasted, Mr. Mukesh’s child-like enthusiasm in engaging all of us left us all grinning ear-to-ear well after the day was over. As an ending note, let me express my gratitude to Dr. Maran, Mr. Ramesh, Mr. Mukesh Jain, Velu, Mani, many parents and volunteers who made this event happen (Devika, Divya, Nandhini, many more I am sure ). God bless them with a happy, healthy life! very good information and very insightful,most of the videos of DR Maran ,are in tamil, are there any videos with english translation also Can you kindly let me know where one can find the Mr Maran’s recipe book..
Can you kindly let me know where one can find the Mr Maran’s recipe book.. Soon we will publish the book. As of now, no, may be in 2019. Based on what the community offers. Please share your view at this thread. Indeed it was a very good session. I was blessed to attend, meet&greet everyone in the event. Very good write up in the blog. This community puts together extraordinary effort to bring back the traditional way of living! I want to must follow this lifestyle. Next Next post: Do you really need to drink milk?